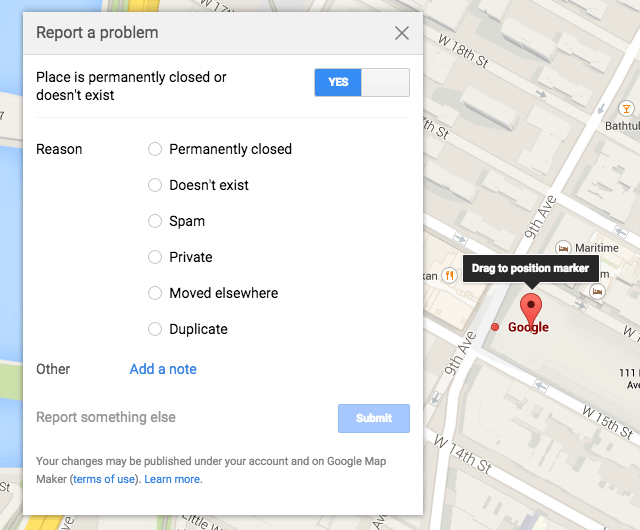 Google has quietly pushed out an update to how you send edits in for businesses found in Google Maps. Now when you click on a business within Google Maps there is a toggle at the top right to send in modifications to communicate if the place was closed or does not exist. The reasons they offer include permanently closed, doesn't exist, spam, private, moved elsewhere or duplicate. The moved elsewhere is an important option because it is and has been incredibly hard to communicate business relocations to Google. It’s now a lot easier to communicate to Google that you have moved to a new location and link the old page to the new page if necessary. Google is stepping up their spam fighting game. Spam will most likely never be completely eradicated, but it’s always good to see a step in the right direction. Forum discussion at Local Search Forums and Google+.